Definition at line 59 of file file.c. Definition at line 105 of file file.c. Definition at line 106 of file file.c. Definition at line 104 of file file.c. Definition at line 103 of file file.c. Definition at line 155 of file file.c. Definition at line 113 of file file.c. Definition at line 115 of file file.c. Definition at line 112 of file file.c. Definition at line 98 of file file.c. Definition at line 92 of file file.c. Definition at line 97 of file file.c. Definition at line 91 of file file.c. Definition at line 95 of file file.c. Definition at line 96 of file file.c. Definition at line 94 of file file.c. Definition at line 93 of file file.c. Definition at line 100 of file file.c. Definition at line 683 of file file.c. Definition at line 430 of file environ.c. Definition at line 9 of file fmode.c. Definition at line 691 of file file.c. Definition at line 713 of file file.c. Definition at line 765 of file file.c. Definition at line 1354 of file file.c. Definition at line 1318 of file file.c. Definition at line 931 of file file.c. Referenced by _dup2(), _pipe(), _wfsopen(), fclose(), test__creat(), test_chsize(), test_file_write_read(), test_get_osfhandle(), test_setmode(), and tmpfile(). Definition at line 829 of file file.c. 842 * so we ignore this error. Definition at line 2039 of file file.c. Definition at line 1025 of file file.c. Definition at line 967 of file file.c. Referenced by _dup(), test_dup2(), test_stat(), and test_stdin(). Definition at line 1041 of file file.c. Definition at line 1081 of file file.c. Referenced by msvcrt_free_io(), and test_fopen_fclose_fcloseall(). Definition at line 1504 of file file.c. Definition at line 2906 of file file.c. Definition at line 3027 of file file.c. Definition at line 2833 of file file.c. Referenced by fgetc(), and test_filbuf(). Definition at line 1544 of file file.c. Definition at line 1563 of file file.c. Definition at line 1582 of file file.c. Definition at line 14 of file _flsbuf.c. Referenced by fputc(), fwrite(), test_flsbuf(), and test_invalid_stdin_child(). Definition at line 893 of file file.c. 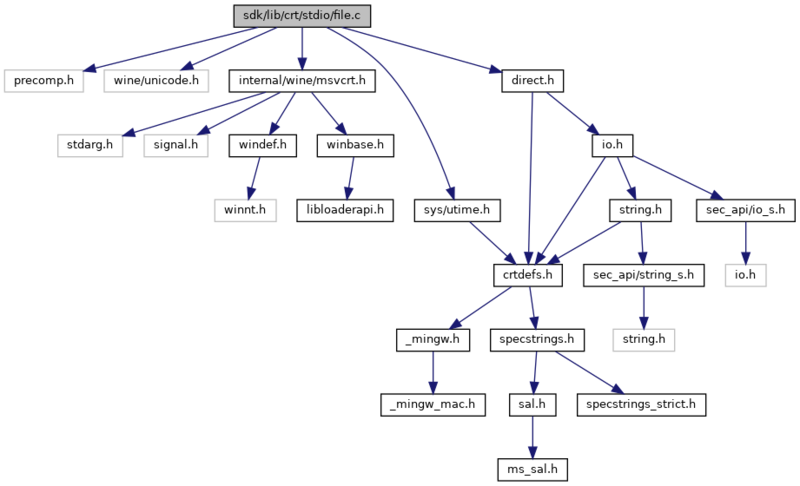 Referenced by msvcrt_free_io(), test_fflush(), and wmain(). Definition at line 3330 of file file.c. Definition at line 3177 of file file.c. Definition at line 1278 of file file.c. Definition at line 3219 of file file.c. Definition at line 3504 of file file.c. Referenced by _fseeki64(), fgetpos(), and ftell(). Definition at line 1591 of file file.c. Referenced by test_close(), test_get_osfhandle(), test_invalid_stdin_child(), and test_stdin(). Definition at line 4026 of file file.c. Definition at line 2994 of file file.c. Definition at line 3663 of file file.c. Definition at line 565 of file file.c. Referenced by add_std_buffer(), and msvcrt_alloc_buffer(). Definition at line 1193 of file file.c. Referenced by _filbuf(), _fseeki64(), _ftelli64(), _getw(), _getws(), _putw(), _putws(), clearerr(), fclose(), fflush(), fgetc(), fgets(), fgetwc(), fgetws(), fputc(), fputs(), fputws(), fread(), fsetpos(), fwrite(), gets(), puts(), rewind(), setvbuf(), ungetc(), and ungetwc(). Definition at line 1220 of file file.c. Definition at line 1185 of file file.c. Referenced by _filelength(), _tell(), _write(), test__creat(), test_chsize(), test_fflush(), and test_file_write_read(). Definition at line 1138 of file file.c. Referenced by _chsize_s(), _filelengthi64(), _fseeki64(), _ftelli64(), _lseek(), _telli64(), and fsetpos(). Definition at line 1604 of file file.c. Definition at line 2001 of file file.c. Referenced by _creat(), compat_open(), install_from_unix_file(), main(), process_file(), rd_open_file(), test_chsize(), test_file_write_read(), test_get_osfhandle(), test_setmode(), and tmpfile(). Definition at line 2057 of file file.c. 2065 * text - it never sets _O_BINARY. Referenced by test__open_osfhandle(), and test_close(). Definition at line 1702 of file file.c. Referenced by test_pipes(), and test_stat(). Definition at line 2764 of file file.c. Definition at line 3701 of file file.c. Definition at line 3728 of file file.c. Definition at line 2466 of file file.c. Referenced by _filbuf(), fread(), test__creat(), and test_file_write_read(). Definition at line 2094 of file file.c. Definition at line 4034 of file file.c. Definition at line 2477 of file file.c. Definition at line 1978 of file file.c. Referenced by _open(), and test_get_osfhandle(). Definition at line 1962 of file file.c. Definition at line 2519 of file file.c. Definition at line 2527 of file file.c. Definition at line 2535 of file file.c. Referenced by test_chsize(), test_ctrlz(), test_fflush(), test_fgetc(), test_fgetwc(), test_file_put_get(), test_file_write_read(), test_flsbuf(), test_fputc(), and test_write_flush(). Definition at line 2574 of file file.c. Definition at line 803 of file file.c. Referenced by test__wfopen_s(), test_chsize(), test_fopen_fclose_fcloseall(), test_fopen_s(), test_fputwc(), test_get_osfhandle(), test_setmode(), and test_unlink(). Definition at line 1205 of file file.c. Definition at line 728 of file file.c. Definition at line 750 of file file.c. Definition at line 784 of file file.c. Definition at line 2048 of file file.c. Definition at line 1520 of file file.c. Definition at line 3272 of file file.c. Definition at line 3280 of file file.c. Definition at line 3419 of file file.c. Definition at line 3185 of file file.c. Referenced by _fsopen(), and _wfopen(). Definition at line 1640 of file file.c. Definition at line 2020 of file file.c. Referenced by _wcreat(), _wfreopen(), compat_open(), and gz_open(). Definition at line 3761 of file file.c. Definition at line 3787 of file file.c. Definition at line 2585 of file file.c. Referenced by _putw(), fwrite(), msvcrt_flush_buffer(), test__creat(), test_chsize(), and test_file_write_read(). Definition at line 1939 of file file.c. Referenced by _wfsopen(), and _wopen(). Definition at line 1778 of file file.c. Referenced by _sopen_s(), and _wsopen(). Definition at line 2556 of file file.c. Definition at line 3880 of file file.c. Definition at line 816 of file file.c. Definition at line 594 of file file.c. Definition at line 191 of file file.c. Referenced by get_ioinfo_alloc(), and get_ioinfo_alloc_fd(). Definition at line 1752 of file file.c. Definition at line 1363 of file file.c. Referenced by rewind(), and ungetc(). Definition at line 411 of file file.c.